Collecting issues #1-24 (which had a break between issues 12 and 13 as new arcs started and such) and a the extra-big special that topped off the run, this Omnibus collects the entirety of Joss Whedon's writing for the Astonishing X-Men book that kinda-sorta picked up where Grant Morrison's New X-Men left off by bringing back certain plot points but also stood well on its own. This was a run that had some utterly amazing moments, but as a solid whole is really, really good, but I can't quite say great. Oh, spoilers, but most of this stuff is being dealt with in current X-Men comics so whatever. Over this story-line there is the over-arching plot of a planet called the Breakworld wanting to get rid of mutants because it is predicted that one day a mutant will be responsible for the end of their planet. This results in an interesting first story arc where a cure for the mutant gene is discovered and all sorts of mayhem results, then we learn that the Danger room is actually a sentient computer that Professor Xavier cruelly ignored the pleas of to train his team, before it finally breaks free and causes all sorts of damage before being stopped. That's the first 12 issues, and while they lack some of the incredible little moments that #13-24 and the special have, they are stronger overall in the general plot. This also started the trend of showing Professor Xavier as not being a perfect angel, something other writers picked up on for future story-lines that made him out to have done some real bad things in the past in pursuit of his goal of a better world. Oh, plus for these first 12 issues the book actually mostly seemed to come out on time and had the amazing art of John Cassaday which tickles your eyes (the whole series had his art, but it was actually timely early on). The next six issues of #13-#18 were kind of decompressed, taking place as Emma Frost seemed to be evil again and slowly taking the team apart, with a big reveal about Cyclops--that is one thing I really liked about this series, it did a good job with Cyclops so it gets props for that. Plus Cassandra Nova from Grant Morrison's run pops up and that rocks. The psychological destruction of the team is great, with Beast becoming an animal and Wolverine acting like a small child, its crazy stuff. At the end of this arc the team goes off to the Breakworld and we have some action packed issues that took forever to come out due to delays but make an interesting counter to the quiet of the arc they come right after. Yeah, the stuff on the Breakworld where the X-Men just outright confront the aliens is pretty cool, and the final little twists are neat, even if the big conclusion with Kitty Pryde being trapped in the huge bullet that was shot at earth being kind of silly (Don't worry, Uncanny X-Men brought her back to earth a year or so later). Maybe it is how the pacing goes from glacial to break-neck, or the slightly weak conclusion, but issues #13-24 and the special are still pretty good but are a bit weaker to me compared to the earlier stuff. 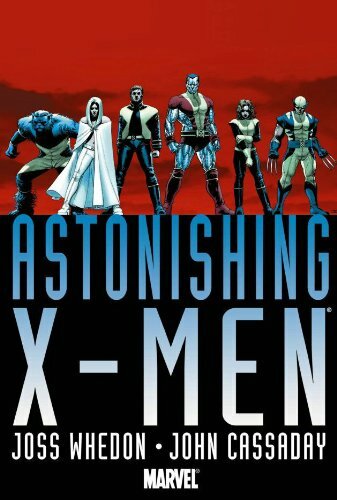 Astonishing X-Men Omnibus if you want it. Kitty has always been a favorite character of mine -- so I enjoyed the second half of Astonishing X-Men quite a bit, with its increasing focus on her and the relationship between Kitty and Colossus. The ending, in my opinion, was the perfect culmination of the arc that Whedon had developed for the character. I'm curious, what kind of extras does the Omnibus have? I bought this in single issue form as it was coming out and I've wondered for a while whether it's worth having on my shelf too. The ending was great in terms of how Whedon developed Kitty, I just found elements of the whole "space-bullet" and things to be odd. As for extras the Omnibus includes: At the start is a short history of X-Men continuity for new readers, and in the back all the other stuff is found. What stuff? The Brian K. Vaughn introduction from the Vol.1 hardcover, all the variant covers, 3 pages of emails sent between Joss Whedon and folk when planning the comic, some character sketches by John Cassaday, an advertisement for Astonishing X-Men that ran various places, and the Marvel Spotlight interview with John Cassaday. Not a bunch, but at least there is something, plus there is something snazzy to having the whole run in one big book.